News: students at the Eindhoven University of Technology have unveiled what they claim to be the world's first solar-powered family car. Called Stella, and resembling a squashed, wingless aeroplane, the vehicle can seat four people and can travel up to 600 kilometres, powered by solar panels mounted on the roof. The vehicle has been developed to take part in the new Cruiser Class category of the World Solar Challenge - a biannual 3,000km race race through the Australian outback from Darwin to Adelaide. This new category will be introduced for the first time at this year's event, taking place from 6-13 October, to reflect the growing interest in commercially viable solar cars. Unlike the other categories, where speed is the main concern, the Cruiser Class is judged on criteria including comfort and usability. Cruiser Class vehicles must also carry a passenger as well as a driver. "The design of the car of the future has to meet the needs of modern consumers," says Solar Team Eindhoven, which is based at Eindhoven University of Technology. "The car must be capable of transporting a family from the Netherlands to France in one day, it needs to be suitable for the daily commute to work, and it needs to achieve all this in comfort." "Since the Solar Team Eindhoven wants to contribute to the development of a car of the future, the design demands more than just a focus on speed," the team adds. "Comfort, ease of use, and feasibility are all key terms." The carbon and aluminium car features a buttonless, touchscreen dashboard and a responsive steering wheel that expands or contracts according to your speed. Solar panels on the car's roof will generate around half the energy it requires, with the remaining power coming from solar recharging stations. Solar Team Eindhoven's website provides more details of the World Solar Challenge race. "A large part of the energy to be used will be collected by solar cells as we travel," it says. "During the race, there are only three opportunities to recharge the relatively small battery, which means the car has to be able to independently drive a minimum of 750 kilometers on electric energy. Besides the issue of energy and its management, navigation, safety and support will be essential. "Once the race starts in Darwin, the teams are permitted to drive until 5.00 p.m. in the afternoon. After that, they have to set up camp in the outback and be ready to leave again at 8.00 a.m. The teams must be completely self reliant and must reach all seven checkpoints." Photos are by Bart van Overbeeke/TU Eindhoven. 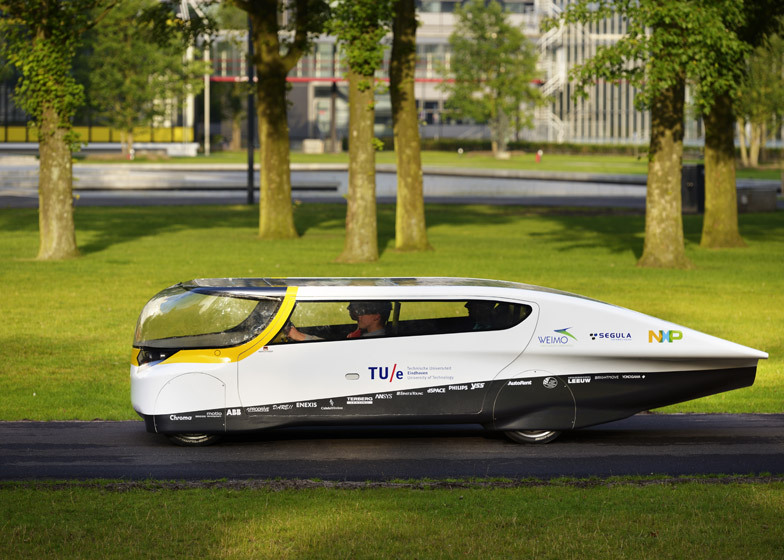 The Solar Team Eindhoven (STE) of Eindhoven University of Technology (TU/e) presented the world’s first solar-powered family car today. ‘Stella’ is the first ‘energy-positive car’ with room for four people, a trunk, intuitive steering and a range of 600 kilometers. This is the car being entered by the student team in the Cruiser class of the World Solar Challenge that starts in Australia in October 2013. The solar cells of ‘Stella’- Latin for star and also a reference to the family character of the car – generate more electricity on average than the car uses and that means the surplus electricity can be returned to the power grid, thereby making the car ‘energy-positive’. Solar Team Eindhoven has set itself the goal of developing the car of the future. By combining aerodynamic design with lightweight materials like carbon and aluminum, a very fuel-efficient car has been designed, which also has ingenious applications like a LED strip and touchscreen that make all the buttons and knobs we know today superfluous. Intuitive driving is enabled by a steering wheel that expands or contracts when you are driving too fast or too slowly. STE will have the car officially certified for road use to prove that this really is a fully-fledged car. University teams from all over the world will be competing in a 3,000 km long race through the Australian outback. Solar Team Eindhoven is taking part in the Cruiser class in which the emphasis lies on practical and user-friendly solar cars rather than on speed. The ‘solar race’ takes place from 6 to 13 October 2013. Back in the Netherlands there will be a tour of high schools to promote engineering and science in education. Thanks to Solar Team Eindhoven entry, TU/e is represented for the first time in the Solar World Challenge. A multidisciplinary team (with 22 students from six different TU/e departments) has spent a year on this project that involves challenges from the fields of energy and mobility. Cooperation with industry has given the students an opportunity to become familiar with top-notch entrepreneurship, thereby underlining TU/e’s vision of educating the engineer of tomorrow. TU/e professors prof.dr. Elena Lomonova and prof.dr.ir. Maarten Steinbuch are members of the steering group. Eindhoven University of Technology (TU/e) is a research-driven, design-oriented technology university with a strong international focus. The university was founded in 1956 and has around 7,200 students and 3,000 staff. TU/e is geared to the societal challenges posed in the areas of Energy, Health and Smart Mobility.